I felt off the next couple of weeks, almost in a daze with increased anxiety and fatigue. I contributed this to over extending myself at work and fought through it knowing that summer was just around the corner. Then I woke up one morning and had severe pain in my fingers on my dominant hand. Within a week I had this crawling/tingling feeling in my forearms and was unable to perform any repetitive task without getting this extreme nauseous feeling. Within three months my lower body was experiencing similar symptoms as my upper body. Other than my core my connective tissues throughout my entire body felt like string cheese and as the days passed I felt I was being pulled apart physically and emotionally. The next year would bring a long list of side effects including: widespread tendonitis, hives, joint pain, extreme muscle aches, pulsating nerve pain and the list goes on. Because I had been athletic and active all of my life with no prior health problems my symptoms became quite alarming. I was then misdiagnosed with Rheumatoid Arthritis and given more prescription medication (Prednisone and Sulfasalzine). 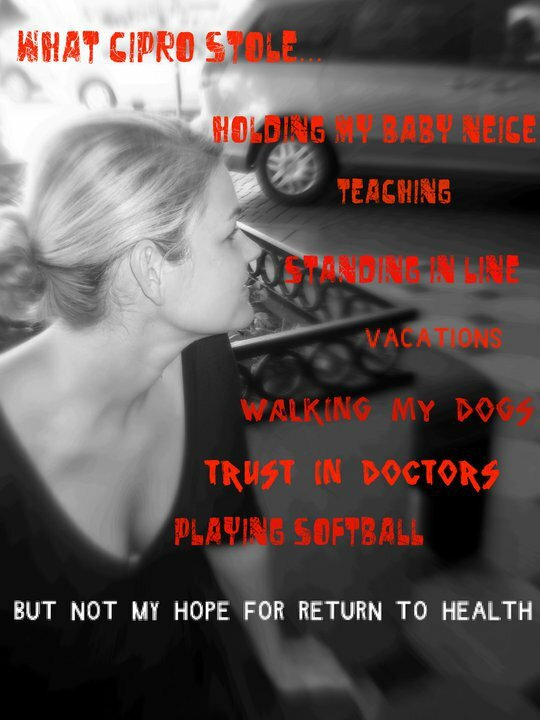 Some of my symptoms improved while others became worse including my hope for returning to health. When answers from my doctor didn’t make sense I went searching for something that did. On one of my darkest days and the one year anniversary of taking my first Cipro pill, I opened my medicine cabinet and found the Cipro bottle staring back at me. 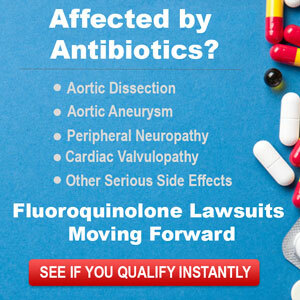 I never did take all ten pills that were prescribed because of how sick they made me feel, but I also never connected the dots that this antibiotic could be the cause of my living nightmare and literally poisoning my body. The research began and quickly I discovered the answers I had been so desperately searching for. These answers made perfect sense and put light back in my life giving me strength to press on. Throughout this entire experience the worst was the unknown and though I was terrified reading others stories, I also felt comfort in knowing that others had survived and some even recovered. I now have an extremely supportive doctor who has set up a team of specialists who are hopeful for my recovery. The loss of what Cipro stole is overwhelming and has affected every aspect of my life, but each day is a day closer to recovery. My faith will remain strong and my determination to save others from Cipro will never end.